Texas Toast is not your ordinary toast. While you may toast bread in the oven, Texas Toast is a crispy buttery bread with a touch of garlic and if you like a sprinkle of Parmesan cheese is a nice change from a roll or even a biscuit. While everything may be bigger in Texas, this toast wasn’t made big intentionally. It actually began life as an accident. According to Wikipedia, this toast got its start in Beaumont, Texas when a bakery sliced some bread too thick. The bread was so large it wouldn’t fit in the toaster so the cook thought he would butter the bread and put it on a griddle. Love for this thick-cut, buttery garlic bread toast has spread well beyond the Lone Star State. These days many grocery stores sell thickly-sliced bread for making Texas toast. Now keep in mind that this bread doesn’t come already toasted unless it’s in the frozen food section. However, you can easily make your own Texas toast from scratch. Honestly, when I have made this I have used regular sliced bread. Either way, it will work great. If you buy untoasted Texas toast bread, you can use the rest of the loaf for French toast. Instead of placing this on the grill, I am going to suggest that you pop it under the broiler in your oven. I think the broiler works very well in creating a toast that is evenly crispy all over. Also, using the broiler makes it easy to cook several pieces at once. I think the real key to making good Texas toast is making sure you toast both sides of the bread evenly. You want each side to be indistinguishable from the other. For this garlic toast recipe, I am going to add just a little bit of Parmesan cheese because it has a nutty flavor. You could add Cheddar or Mozzarella, or honestly just about any type of cheese will work well. If you do not like garlic, you may want to use seasoned salt instead. Looking for More Ways to Make Toast? Check out these copykat toast recipes. Make Texas toast at home. It's so easy Texas Toast. Set your oven to broil. Soften butter, and bread butter evenly on each side of bread for all four pieces. Lightly sprinkle garlic powder over the toast, on both sides. Place the buttered bread under the broiler. The bread will toast for 1 to 3 minutes. The closer the bread is to the broiler the faster it will toast. 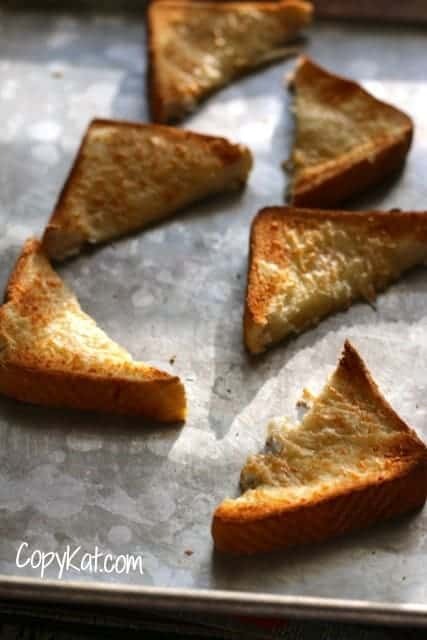 Once the first side is toasted remove it from the oven, flip over the bread to where the untoasted side is up, and add about 1 teaspoon of cheese to each slice of bread. Toast the bread until it is light and golden brown. Man, I haven’t had this since Bonanza when out of business. I mix the garlic powder and parmesan cheese into the softened butter and spread on the Texas Toast. Fry it, butter side down, in a cast iron skillet. (Don’t fry/cook the other side). Serve with Caesar Salad or a big Spinach Salad with warm bacon/parmesan dressing. What do you like to serve Texas Toast with? Ha ha, you must be a Trump fan. I make it by using softened butter combined with garlic powder, grated Parmesan cheese and chopped parsley. Must admit I have never bought the frozen kind found in grocery stores. I have toyed with the idea of adding other ingredients to it but have yet to do it.